You might be thinking zucchini lasagna?! But, remember when I told you how I like to replace gluten filled pasta with vegetables? 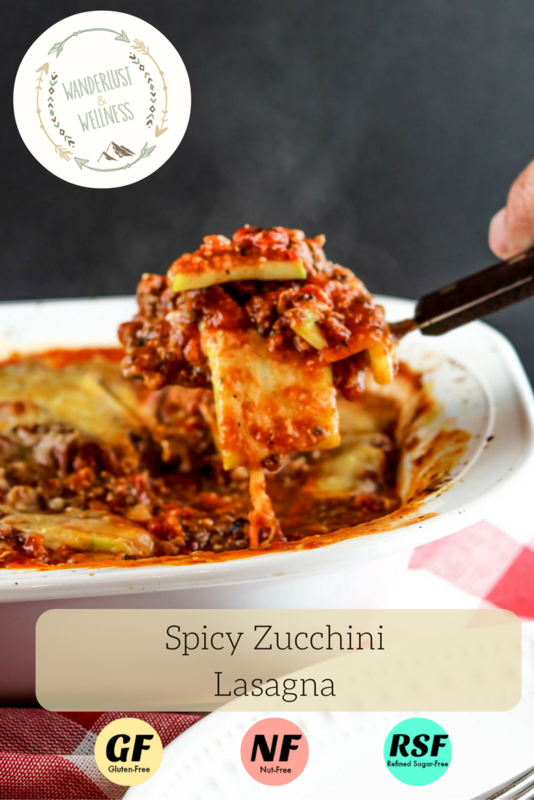 Well this spicy zucchini lasagna is a perfect example of just that! 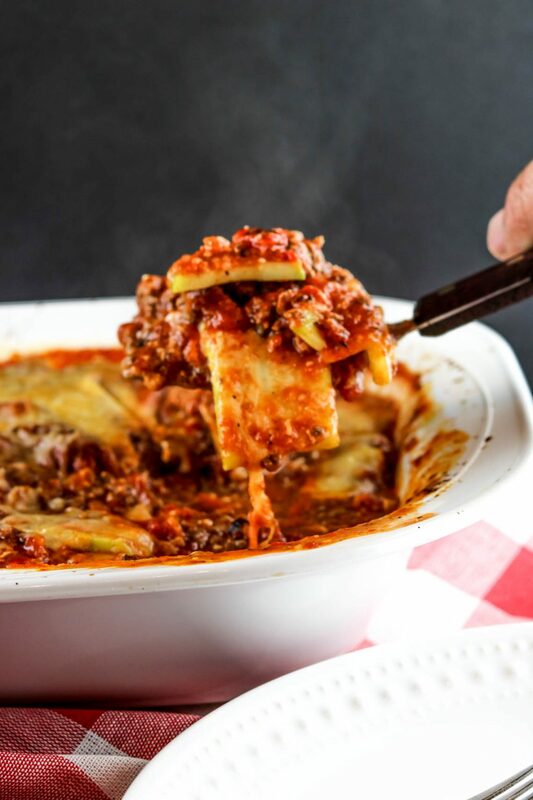 The zucchini slices replace the normal pasta lasagna noodles and then I reduce down the amount of cheese (but don’t worry, there’s still cheese) and voila, you have a primal approved (Paleo-ish) lasagna that tastes delicious! 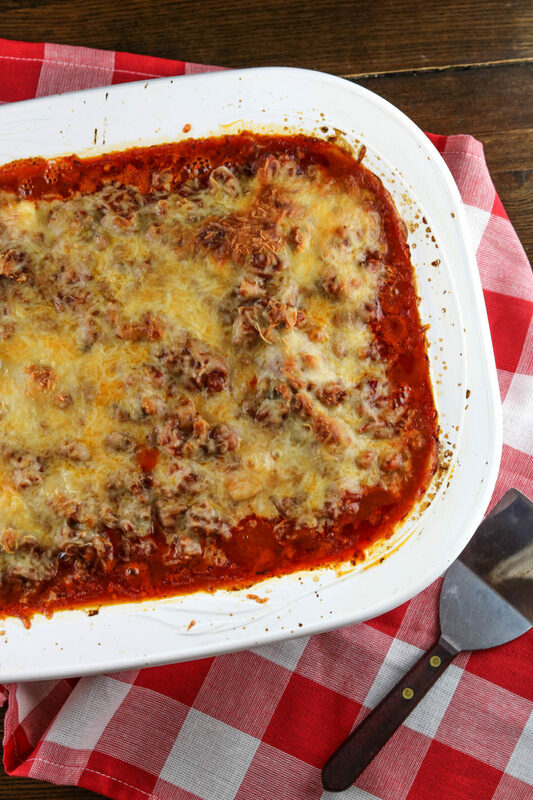 This is also another example of an Italian dish where I like to use a combination of sweet Italian sausage and grass-fed beef. It gives you a hint of the sweet sausage but not too overpowering. Bravo has a delicious lasagna that has sausage and beef and alfredo sauce. Man, it’s heaven, but my body will kick it out as soon as it enters. (Sorry, TMI??) But seriously, this is a good example of what I talked about in my recent post about intuitive eating and listening to your body and how it handles various food types. But, I’ll save that conversation for another post. Back to this spicy zucchini lasagna! This recipe is going to call for a spicy pasta sauce. I like to use Dave’s Gourmet Organic Spicy Heirloom pasta sauce. It is so good, Dave’s is probably my all time favorite go-to pasta sauce. If you can’t find this particular sauce, look for any other organic pasta sauce that indicates spicy. One last note on this spicy zucchini lasagna, because it doesn’t have all of the ricotta cheese, pasta noodles, etc. it’s not going to be as firm as regular lasagna. It will fall apart when you dish is out, but don’t worry, it tastes so good you won’t even notice. In a large skillet, brown the beef and Italian sausage, drain excess grease. Add in seasonings, diced tomatoes, tomato paste, and spicy pasta sauce and let simmer on low for about 10 minutes. 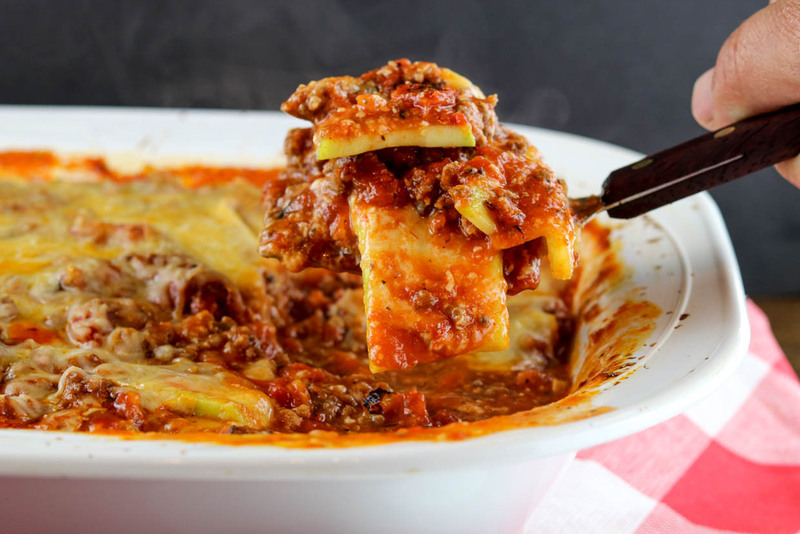 While sauce is simmering, peel zucchini and slice lengthwise into thin slices that resemble long lasagna noodles. You can use a mandolin or just a knife, they don’t have to be exact. I sometimes like to keep my thicker to help with giving the lasagna stability. Grease a 9×13 baking dish with coconut oil. 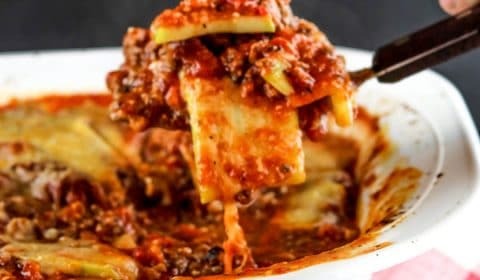 Start layering the lasagna by first adding a layer of the meat sauce mixture to the bottom, then a layer of zucchini noodles, then mozzarella cheese. Repeat again, ending with cheese on top. Bake for about 30 minutes, remove from oven and let sit for 5 minutes before serving.